More information on all the new features and changes in Visual Studio for Mac 8.0 can be found in the release notes. After installing the Xamarin.GooglePlayServices.Basement NuGet package, into a project that used PackageReferences, the GoogleServicesJson build action, defined by this NuGet package, was not available in the list of build actions when you right clicked a file in the Solution window. The build action was available after the solution was closed and re-opened. Installing a NuGet package into a project that used PackageReferences would not re-evaluate the project’s MSBuild information. This resulted in any custom AvailableItemNames not being available to be used as a build action in the Solution window. The build actions for a project were cached so these are now cleared to ensure the latest items are available after an re-evaluation. The NuGet extension API has a PackageReferenceAdded event and a PackageReferenceRemoved. These were being raised if a project had a packages.config file but not if the project used PackageReferences. More information on all the new features and changes in Visual Studio for Mac 7.8 can be found in the release notes. NuGet package diagnostic warnings are now shown in the Solution window. 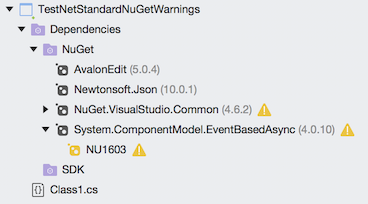 The diagnostic warnings are shown underneath the NuGet package with a warning icon. Hovering over the warning icon will show a tooltip. Projects that have multiple target frameworks now have all frameworks restored. Previously only the first target framework would be restored. Conditional PackageReferences defined in the project file are also now respected when restoring the project. Previously the conditions on the PackageReferences would be ignored. Visual Studio for Mac now uses the GenerateRestoreGraphFile MSBuild target to determine package dependencies. Previously this information was obtained from the project information held in memory. This fixes several NuGet restore bugs in Visual Studio for Mac. Creating an xUnit .NET Core test project named ‘xunit’ fails to restore since there is a package reference cycle between the project and the xunit NuGet package. Whilst this reference cycle is reported it is hidden in the Package Console output and all you would see was a message indicating that the restore had failed. Now the error information is shown at the end of the Package Console as a summary of the failures to make it easier to see the problem. xunit -> xunit (>= 2.3.1). With an ASP.NET Core 2.1 project, that had included a PackageReference for Microsoft.AspNetCore.App version 2.1.5, Visual Studio for Mac would incorrectly restore Microsoft.AspNetCore.App version 2.1.1. Using the GenerateRestoreGraphFile MSBuild target to determine package reference information when restoring has fixed this problem. When Paket is used with an SDK style project it injects PackageReferences via the PaketRestore target from the Paket.Restore.targets file. Visual Studio for Mac was not using MSBuild to get the package reference information so PackageReferences defined by Paket were not being restored or made available. 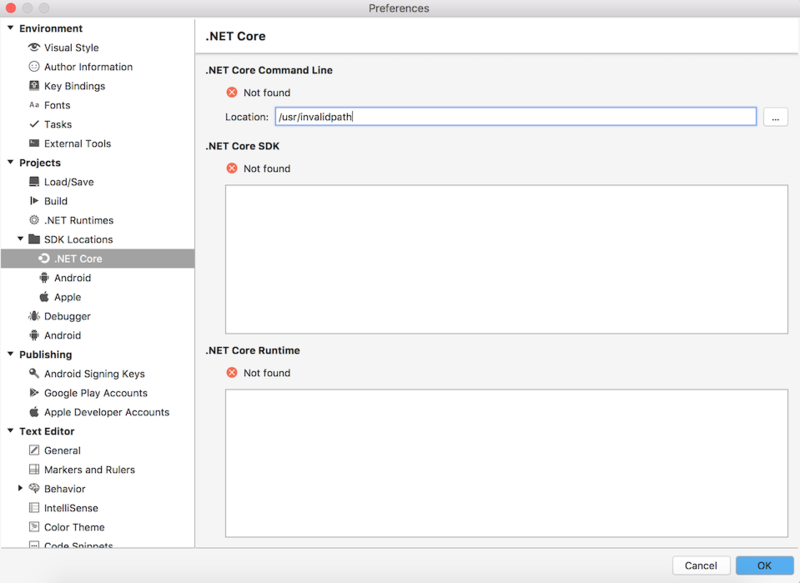 OrchardCore would fail to restore when opened in Visual Studio for Mac. OrchardCore defines the PackageReference versions in a separate MSBuild .props file and has a custom MSBuild target to define these versions. This custom MSBuild target is now supported since Visual Studio for Mac uses the GenerateRestoreGraphFile MSBuild target to determine package references when restoring. The Task Runner Explorer addin provides a Task Runner Explorer window, similar to the one in Visual Studio on Windows, which can be used to run tasks with Cake, Gulp, Grunt, NPM and TypeScript. Visual Studio Mac 7.5 or later. To open the Task Runner Explorer window, from the View menu select Pads, then select Task Runner Explorer. The Task Runner Explorer will look for files supported by a task runner in the solution directory and the project directory. It will also look at all files that have been added to a project or that have been added to a solution folder. The top left of the Task Runner Explorer shows a list of projects or the solution that have tasks available. This can be used to filter the tasks shown in the Task Runner Explorer window. Currently changes made to tasks will not be detected automatically. To refresh the task information you can click the Refresh button available at the top left of the Task Runner Explorer window. To run a task you can double click it or right click and select Run. Output from the task is shown on the right hand side of the Task Runner Explorer window. A long running task, such as tcs watch, will run until the solution is closed, or the Stop button, available on the right hand side of the Task Runner Explorer window, is clicked. If the task runner file is in a project directory then the build and clean events are associated with the project. If the task runner file is in a solution directory then the build events are associated with the solution. To configure a task, right click it, select Bindings and then select the event. The binding will be displayed in the Bindings tab and will also be shown as checked when the context menu for the task is opened. To remove the binding you can right click the task, select Bindings and select the event again to uncheck it. Alternatively you can right click it in the Bindings tab and select Remove. The order in which the tasks are run for a particular IDE event can be changed by right clicking the binding in the Bindings tab and selecting Move Up or Move Down. The binding information is typically saved in a file in the same directory as the corresponding task runner file, however this depends on how the task runner is implemented. In preferences there is a Task Runner Explorer section which shows a check box that can be used to enable or disable the automatic running of tasks on opening a project or solution, and when building or cleaning. The Cake task runner supports running tasks defined in a build.cake file. This is based on the Cake Task Runner for Visual Studio. The Gulp task runner supports running tasks defined in a gulpfile.js file. Gulp needs to be installed separately. The Grunt task runner supports running tasks defined in a Gruntfile.js file. Grunt needs to be installed separately. The NPM task runner supports running tasks defined in a package.json file. The NPM task runner is a port of Mads Kristensen’s NPM Task Runner. The NPM task runner supports running with the verbose NPM option defined. If a task is selected then a button will be displayed on the left hand side of the Task Runner Explorer window. If this is selected then npm will be passed the -d argument when it is run. NPM needs to be installed separately. The TypeScript task runner supports running tcs build and tcs watch if a tsconfig.json file is found. 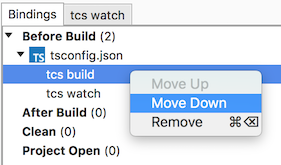 The TypeScript task runner will try to use tsc that is distributed with the Web Tools extension that is included in Visual Studio for Mac. If the Web Tools extension is not installed then the task runner will fall back to running tsc directly. The Task Runner is the main addin. This will be used by other task runner addins and provides the main task runner API and services. The Task Runners Bundle addin contains the Cake, Gulp, Grunt, NPM and TypeScript task runners. These are currently included together as a single addin instead of being distributed separately. Download both of the above .mpack files. Install the Task Runner addin first since the Task Runners Bundle addin depends on it. To install an addin’s .mpack file, open the Extensions Manager by selecting Extensions… from the main menu. Click the Install from file button. Select the .mpack file and then click the Open button. After installing both the addins restart Visual Studio for Mac. These addins are not currently available from the main Visual Studio for Mac extensions server. More information on all the new features and changes in Visual Studio for Mac 7.7 can be found in the release notes. NuGet 4.8.0.5385 is now included with Visual Studio for Mac 7.7.2. Visual Studio for Mac did not support projects that used PackageReferences without specifying a version. The version may be defined elsewhere in another MSBuild file, such as the Directory.props file, or by the .NET Core SDK, as with the Microsoft.AspNetCore.App PackageReference in ASP.NET Core projects. By default a PackageReference without a version will restore the lowest available version for the NuGet package. However in Visual Studio for Mac there were several problems with PackageReferences that did not specify a version. Opening a project with a PackageReference without a Version would result in an ArgumentNullException being logged and the Add Packages dialog could not be opened. If the PackageReference, in a non-SDK project, had no Version then it was not displayed in the Packages folder and a null reference exception was logged. The Solution window would try to find the package to check if it was installed which is not possible with a missing version and NuGet’s VersionFolderPathResolver would throw a null reference exception. If a PackageReference had no Version then a null reference exception was logged when checking for updates. A null version is now handled. Right clicking the package in the Packages folder would log a null reference exception if a non-SDK style project was used and it had a PackageReference without a version. This is now handled and the menu label will show “Version None”. This manifest file not supported and resulted in the NuGet sdk resolver not being loaded. Any projects that use an MSBuild sdk from a NuGet package no longer worked and would result in an ‘Invalid configuration mapping’ error shown in the Solution window. The sdk resolution in Visual Studio for Mac has now been updated based on the latest MSBuild source code. Changing the target framework of a project that uses a packages.config file will result in a package compatiblity check being run. If the project had both a PackageReference and a packages.config file the package compatiblity check would fail with a null reference exception. Visual Studio for Mac was treating the project as though it was using a packages.config file, when it should have been treated as a PackageReference project. This resulted in a null reference exception being thrown when checking for package compatiblity. The Update menu was enabled if the project used PackageReferences but had none in the project. Without any PackageReferences in the project there is no packages to update. The check to determine if the Update menu should be enabled has been changed to make sure the project has PackageReferences in the project file, not just imported PackageReferences. The Update NuGet Packages menu, which is used to update packages for the solution, has also been changed to have the same behaviour. On updating a NuGet package the Reference item will now be modified in place in the project file. On updating a NuGet package in a project that used a packages.config the old NuGet package is uninstalled and the new one is installed. This removes the old references and adds new references. If the references are in an ItemGroup with a condition then the new reference may be added into a different ItemGroup if there are other ItemGroups with references. To prevent this from happening the changes to made to references are cached and not applied to the project until all the NuGet actions have all been run. This allows a NuGet package update which would remove a reference and then add a new reference to be converted into an update of the original Reference in the project, changing just its HintPath, so its location in the project file is not changed. This was fixed in Visual Studio for Mac 7.7.3. Updating a NuGet package, where the project, which uses a packages.config file, had been modified so the original reference had a fully qualified hint path, would result in a relative path used for the hint path when the reference was updated. Now if the original hint path was full path then if the hint path for the reference is changed it is saved using a full path. This is different behaviour to how Visual Studio on Windows works, which will always add a relative hint path for the reference. 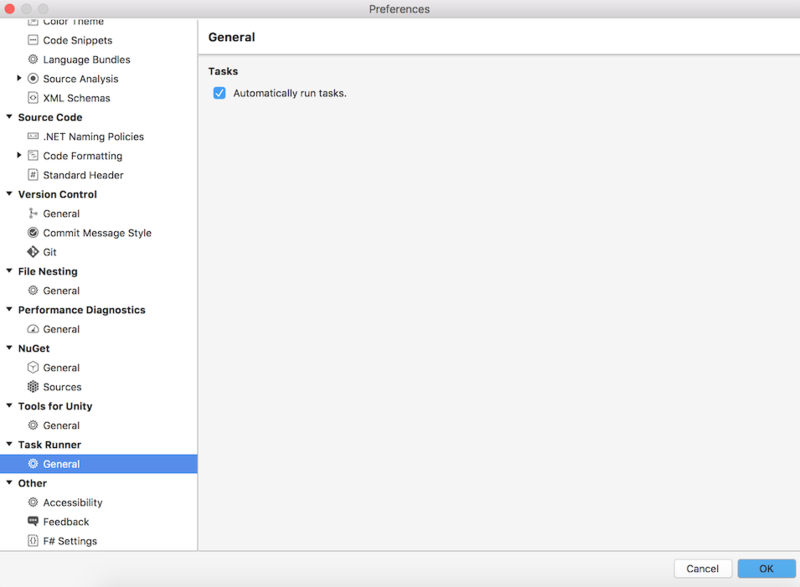 Here we look at using Apache as a proxy server in order to test that a Mac client application, such as Safari or Visual Studio for Mac, can make web requests through a proxy. Enabling Basic and NTLM proxy authentication with Apache will be covered, as well as using the Apache as a proxy without any authentication. Apache will run on a separate Windows machine. Using a separate machine allows us to check that the Mac client application is not bypassing the proxy and making direct web requests to any server. This check can be done by configuring the local firewall to block all direct connections out from the Mac machine but allow connections from the machine running Apache. Unzip Apache and extract the files to c:\Apache24\ which is the default ServerRoot configured in the conf\httpd.conf file. In the httpd.config file configure the port to be used by the Apache server if required. By default port 80 is used. Here we will be using port 8888.
mod_proxy, mod_proxy_connect and mod_proxy_http should be loaded. Edit the http.conf file and ensure these modules are loaded. Add a VirtualHost and Proxy section to the httpd.conf file. 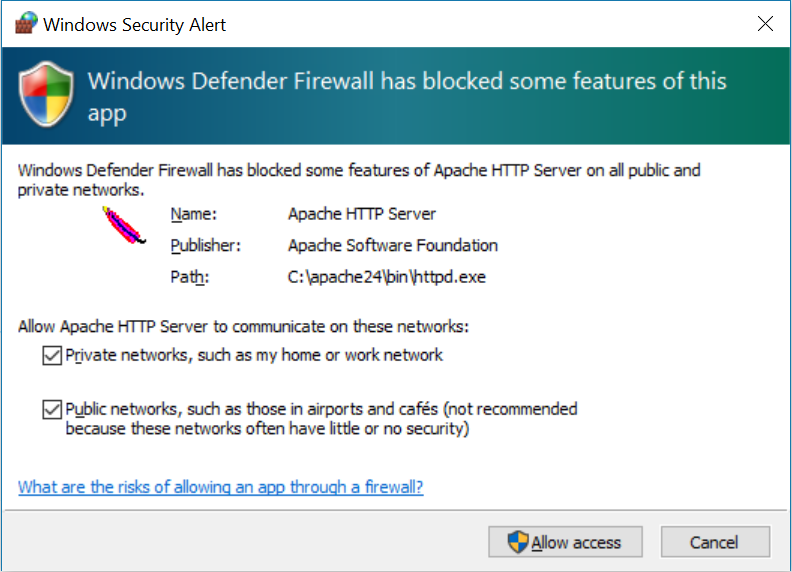 On running Apache for the first time you will see a Windows Firewall dialog. Allow Apache to access both the private and public networks. Configuring the Mac to use Apache as its proxy server can be done by opening System Preferences – Network. For the active network select the Advanced button and open the Proxies tab. Enter the machine IP address where Apache is running and its port into the Web Proxy (HTTP) and Secure Web Proxy (HTTPS) sections, and ensure both of these are checked. Finally click OK and Apply to enable the proxy settings. Now http and https requests should be sent through Apache. A simple way to test this is to open Safari and view a web page. In the C:\Apache24\logs\access.log file you should see entries for the sites accessed. To enable Basic authentication change the Proxy section in the httpd.conf file as shown below. Here we will be using htpasswd.exe to create a file to store the username and password required to authenticate against the proxy server. htpasswd.exe is in the Apache bin directory. Run the following to generate the proxy-password.file, replacing user with the username to be used with the proxy. To make it easier to see the basic auth header being sent you may want to enable forensic logging in Apache. To do this add a LoadModule to the httpd.conf file. Define the path to the forensic log file using an IfModule. Run httpd.exe from the Apache24\bin directory. When connecting through the proxy for the first time the Mac will show a dialog asking for credentials. Clicking the System Preferences button will show open a dialog where you can enter the credentials for the proxy. 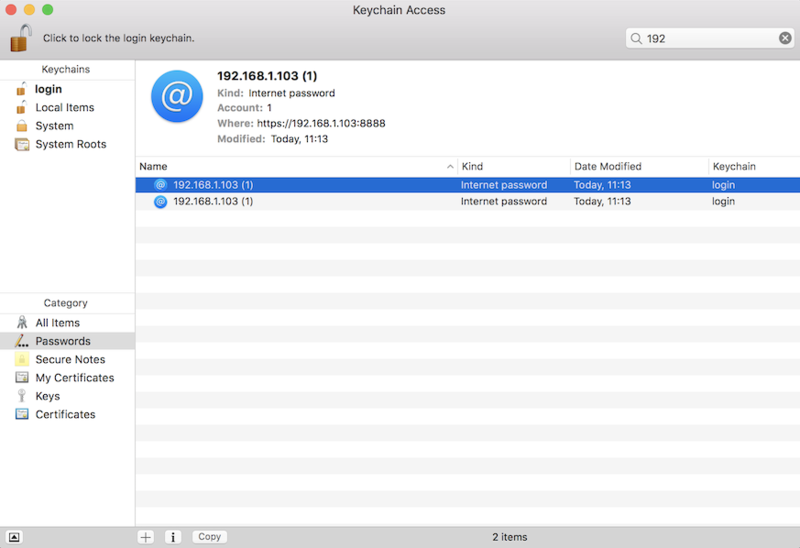 Entering the credentials will result in the Mac’s key chain being updated with the credentials associated with the proxy’s address. 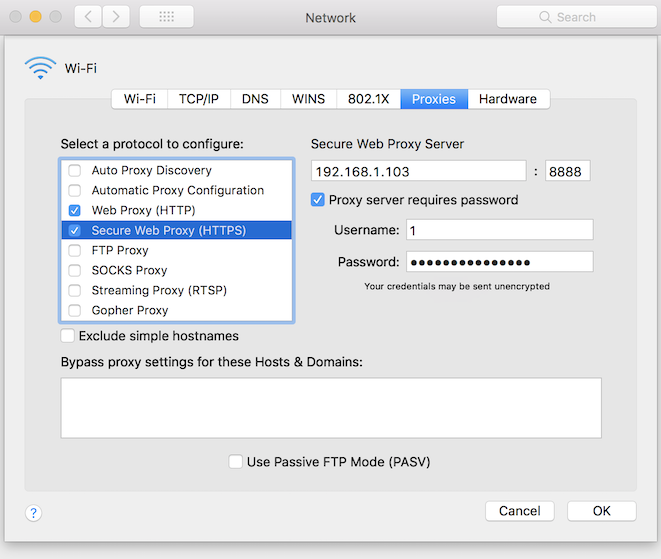 If you open the Mac’s Network settings you will see the Web Proxy and Secure Web Proxy settings now have a username and password associated with them. In the Apache access.log you should see the requests being made and a Proxy authentication 407 status code. In the forensic.log file you should see the basic proxy authorization header being used by the Mac. In order to enable NTLM authentication the NTLM authentication module needs to be downloaded. Download Mod Auth NTLM for Apache 2.4.x x64 – mod_authn_ntml.zip, extract the files and copy the mod_auth_ntlm.so file to the Apache24\modules directory. Add a LoadModule to the httpd.conf file for the mod_authn_ntlm.so file. Require user "NT AUTHORITY\ANONYMOUS LOGON"
The username and password used to authenticate against the proxy needs to match an account on the Windows machine. 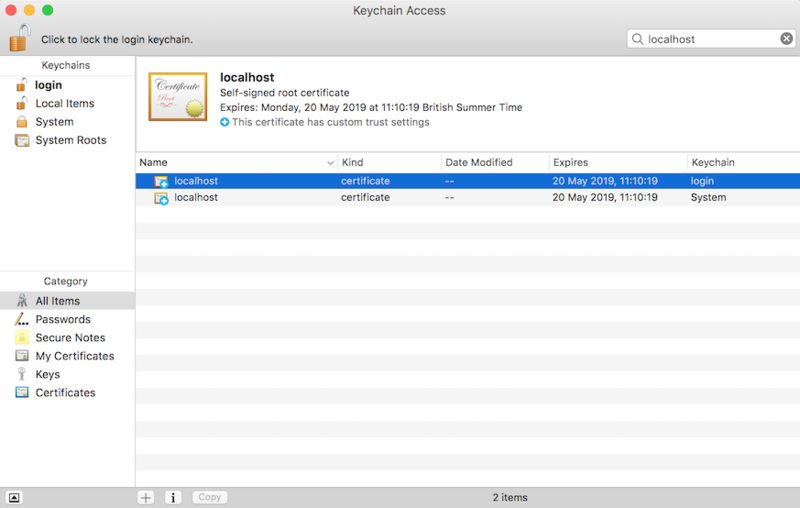 As with basic authentication, the Mac will prompt for credentials if they do not match what is stored in the key chain for the proxy. 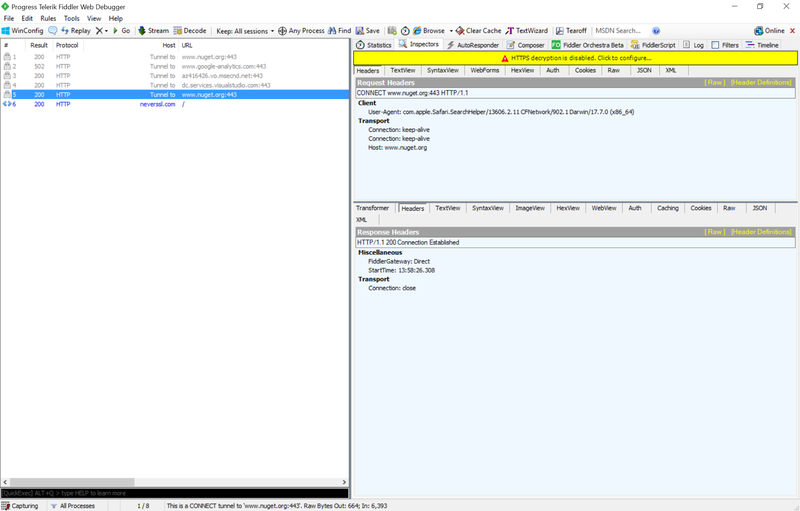 Run httpd.exe and then use Safari to open a web site to check web requests are being sent through the proxy. You should see the Windows account being used to authenticate in Apache’s access.log. The forensic log should show that the NTLM header is being used by the Mac. Here we look at using Fiddler as a proxy server in order to test a Mac client application, such as Safari or Visual Studio for Mac, can make web requests through the proxy. 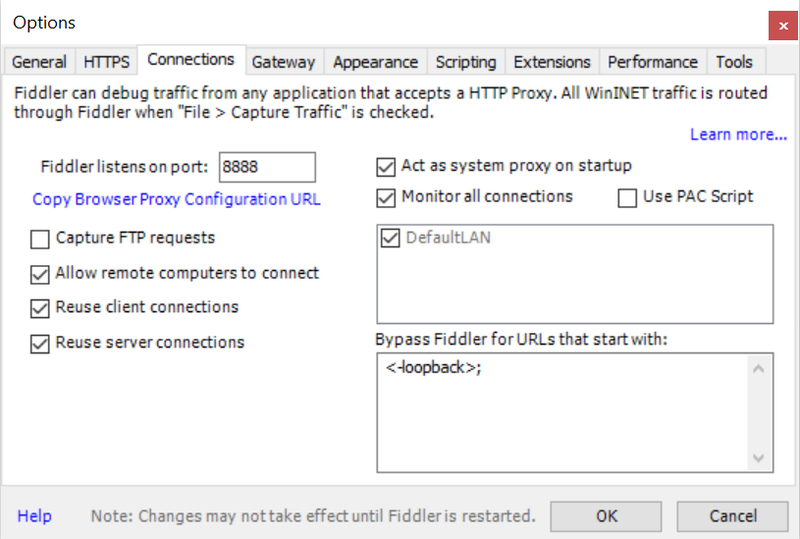 Enabling Basic proxy authentication with Fiddler will be covered, as well as using the Fiddler as a proxy without any authentication. Fiddler will run on a separate Windows machine. Using a separate machine allows us to check that the Mac client application is not bypassing the proxy and making direct web requests to any server. This check can be done by configuring the local firewall to block all direct connections out from the Mac machine but allow connections from the machine running Fiddler. To enable the Mac to use Fiddler as its proxy first configure Fiddler to allow remote connections. This can be done by open the Tools menu, selecting Options, opening the Connections tab, and checking Allow remote computers to connect. 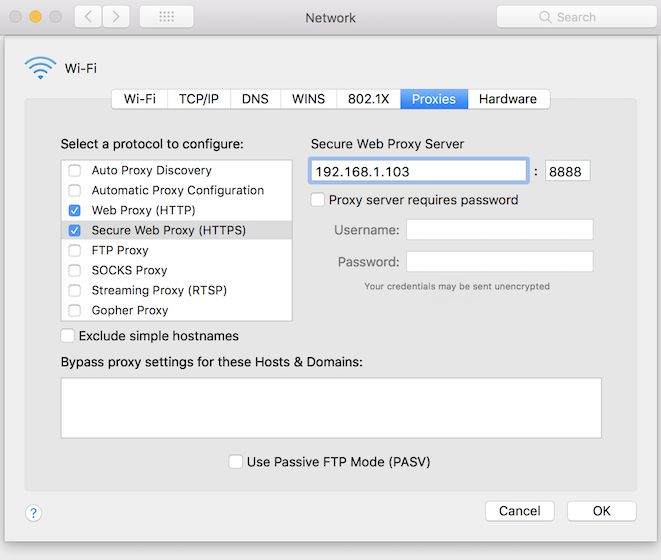 Configuring the Mac to use Fiddler as its proxy server can be done by opening System Preferences – Network. For the active network select the Advanced button and open the Proxies tab. Enter the Fiddler’s machine IP address and port into the Web Proxy (HTTP) and Secure Web Proxy (HTTPS) sections, and ensure both of these are checked. Now http and https requests should be sent through Fiddler. A simple way to test this is to open Safari and open a web page. 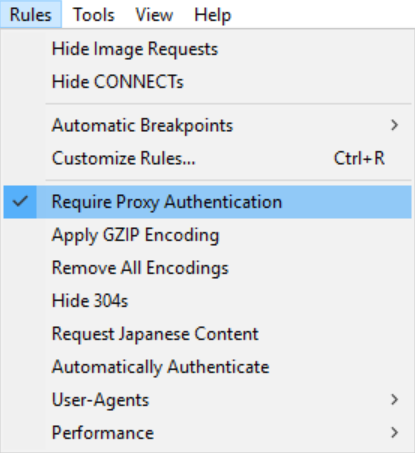 To enable Basic proxy authentication in Fiddler open the Rules menu and ensure that Require Proxy Authentication is checked. This will result in Fiddler requiring Basic authentication with a username ‘1’ and a password ‘1’. Unfortunately it seems that the native Mac networking API does not work with Fiddler for https requests but will work for non-secure http requests. Opening a web page in Safari will cause the Mac to prompt for the proxy credentials. Safari will display an error page when accessing a web page over https when the Mac is configured to use Fiddler’s basic authentation proxy. Fiddler responds with a 407 proxy authentication required response and a close header. Since the keep-alive is not being honoured by Fiddler the web request sent from the Mac fails and an kCFErrorDomainCFNetwork 310 error occurs. This maps to the kCFErrorHTTPSProxyConnectionFailure status code. Other applications that do not use the native Mac networking API, such as the Google Chrome web browser, will work with Fiddler and will prompt for credentials. 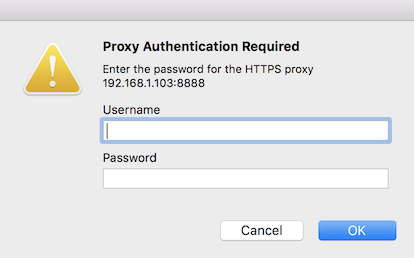 Unfortunately you currently cannot use Fiddler with basic proxy authentication enabled to test a Mac application making https requests. As an alternative you can use another proxy server, such as Apache. 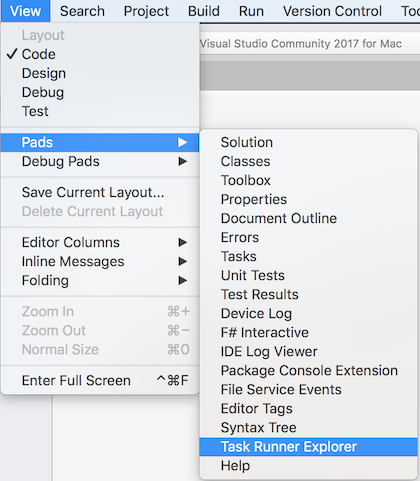 More information on all the new features and changes in Visual Studio for Mac 7.6 can be found in the release notes. Visual Studio for Mac now has support for the NuGet SDK resolver. The NuGet SDK resolver will download and install SDKs for SDK style projects if these SDKs are missing. The SDK resolution is done in the background when the project is opened and there is currently no visual indication that this is happening. The NuGet library assemblies are not available to the remote MSBuild host used by Visual Studio for Mac so the NuGet SDK resolver was previously failing to load. The NuGet SDK resolver supports a MSBUILD_NUGET_PATH environment variable which is now set by Visual Studio for Mac to point to the directory containing the NuGet assemblies that are included with the IDE. Stopping the .NET Core debugger would sometimes result in a dialog being displayed indicating that the debugger operation failed. The .NET Core debugger would sometimes hang Visual Studio for Mac when debugging unit tests. The problem was that if the breakpoint was placed on an invalid line then the .NET Core debugger would send back the adjusted breakpoint location. Visual Studio for Mac would then send back an incorrect breakpoint line back to the .NET Core debugger, which again resulted in the debugger sending back a corrected line. This would repeat resulting in the IDE and debugger getting stuck in a loop. Creating a new .NET Core console project, editing the project run configuration to use extra command line arguments, or to not use the external console, then building and running the project would result in the project run configuration not being used. No extra arguments would be passed to the console project, and the external console would still be used. This could be fixed by closing and re-opening the solution. The problem was that when the project is re-evaluated, after it is created, its run configurations are cleared. The solution’s startup run configuration would still be using the original project run configuration that was no longer used. Changes made to the project run configuration then had no affect. Closing and re-opening the solution fixed this since the run configuration defined in the .csproj.user file is re-used when the project is re-evaluated on reloading so both the solution run configuration and the project run configuration refer to the same configuration. To fix this, on re-evaluating the project, if the solution’s run configuration refers to a project run configuration that has been removed then the solution’s startup configuration is refreshed. Note that there is a similar problem with multiple solution run configurations that can occur which is not addressed by this fix. On loading an SDK style project that did not have a main PropertyGroup Visual Studio for Mac would show the error message “Error while trying to load project: Object reference not set to an instance of an object”. A project may define MSBuild properties in a Directory.Build.props file instead of having this in the main project file. It is then possible for the main project file to have no main property group. Visual Studio for Mac now handles the missing main PropertyGroup. Changing a .NET Core project’s target framework to a different version in Project Options, then re-opening Project Options and changing the target framework version back again, would result in the target framework not being updated in the project. The problem was the original target framework the project had on opening was cached and the changing back to the same target framework version was being ignored resulting in the project file not being updated. Creating a new Xamarin.Forms .NET Standard project, then modifing the .xaml to add new named UI items, would result in no code completion in the .xaml.cs file for these new items until the solution was closed and re-opened. The problem was that the .xaml and .xaml.cs files were being removed from the file information held in memory when the project was re-evaluated. On re-evaluation, after the NuGet restore is first run for the project, the old MSBuild items for the .xaml and .xaml.cs file have the wrong metadata, so they need to be removed, whilst new MSBuild items with the updated metadata need to be added. The removal was done after adding the updated files and, since they had the same filename, the new updated files were being removed. The removal is now done before adding the updated files to avoid the files being removed incorrectly. Adding a new .html file to the wwwroot folder of an ASP.NET Core project would add the file as a None item instead of a Content item. This would result in the .html file not being used when publishing the project. When ‘dotnet publish’ was used the publish directory would not contain the .html file. ASP.NET Core projects have different build actions for files based on where they are added. A .html file in the root directory would be a None item by default, whilst a .html file in the wwwroot directory would be a Content item by default. To fix this the default build action for a file is determined by the file wildcard information available from the .NET Core SDK. Instead of having Microsoft.NET.Sdk.Razor as the name with the version being separate. Opening a SDK style project that used a Sdk attribute with a version would show an error message “Error while trying to load project: Object reference not set to an instance of an object”. The problem was that an SdkResolver can return null from its Resolve method. These null results were added to a list and then an attempt was made to log the result warnings on a null result. Now a check is made to determine if an assembly is referencing netstandard and if so the facade assemblies, which for Xamarin.iOS will include the netstandard.dll, are made available for code completion. Previously only a check was made for the project having an assembly referencing System.Runtime before including the facade assemblies. Assets file has not changed. Skipping assets file writing. No-Op restore. The cache will not be updated. Visual Studio for Mac now has basic support for the NuGet SDK resolver. The NuGet SDK resolver will download and install SDKs for SDK style projects if these SDKs are missing. Visual Studio for Mac now ensures that files generated by a NuGet package are available for code completion. One example NuGet package that generates files is the LibLog NuGet package. The types defined inside these generated files can be referenced by code in the project. Whilst the project would compile without any errors the text editor would show errors about the types from the generated files being undefined. These generated files are not created or returned by running the CoreCompileDependsOn MSBuild target, which is currently used to find generated files. Now when the CoreCompileDependsOn target is evaluated, Visual Studio for Mac will also run NuGet specific MSBuild targets to ensure any NuGet package files are generated and made available for code completion. Installing the FSharp.Core 4.5.0 NuGet package into a F# .NET Core console project would result in version 4.3.4 of the FSharp.Core NuGet package being used and displayed in the Dependencies folder. FSharp.Core 4.3.4 is the NuGet package implicitly added by the F# .NET Core SDK. This was being used by the project instead of the PackageReference defined in the project. PackageReferences in the project will now override any implicitly added NuGet packages. This matches the behaviour of dotnet restore when run from the command line. On updating a NuGet PackageReference the old PackageReference was removed from the project file and then a new PackageReference was added. This resulted in custom MSBuild properties associated with the PackageReference being removed from the project file. Now on updating a NuGet package the version of the existing PackageReference element is updated so any custom MSBuild properties are not removed. 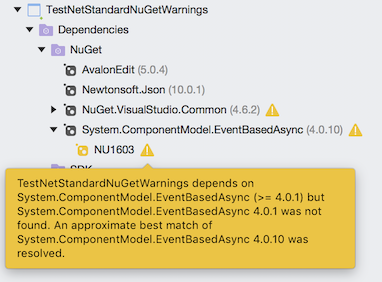 On updating the .NET Standard project to use the same Xamarin.Forms NuGet package version the build error would still occur until the solution was closed and re-opened. Now the remote MSBuild host is shutdown to ensure the correct Xamarin.Forms MSBuild targets and assemblies are used after the NuGet package is updated. 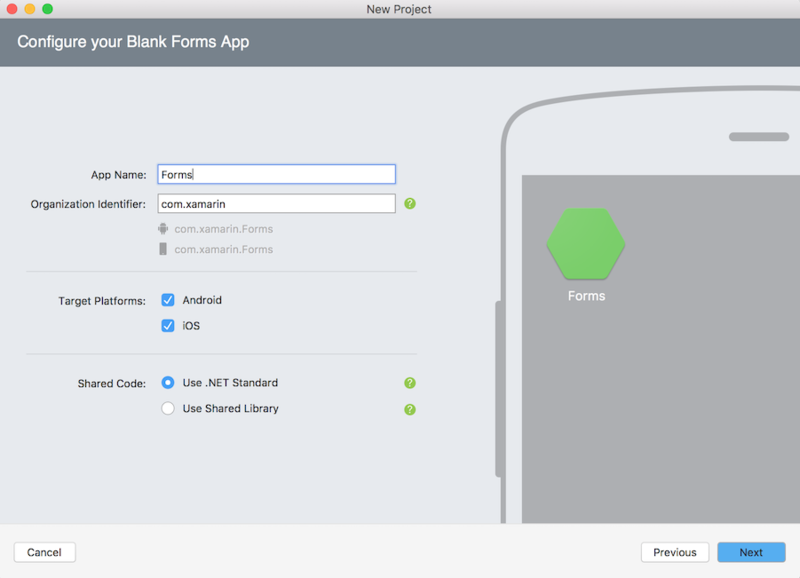 Xamarin.Forms, and if the error persists, please restart the IDE. The problem was that the old MSBuild tasks and targets from the originally used Xamarin.Forms NuGet package were still being used. Now when an MSBuild import has changed in a project the remote MSBuild host is shutdown to ensure the correct MSBuild tasks are used. Visual Studio for Mac 7.5 includes support for the .NET Core 2.1 SDK which is currently available as a release candidate. 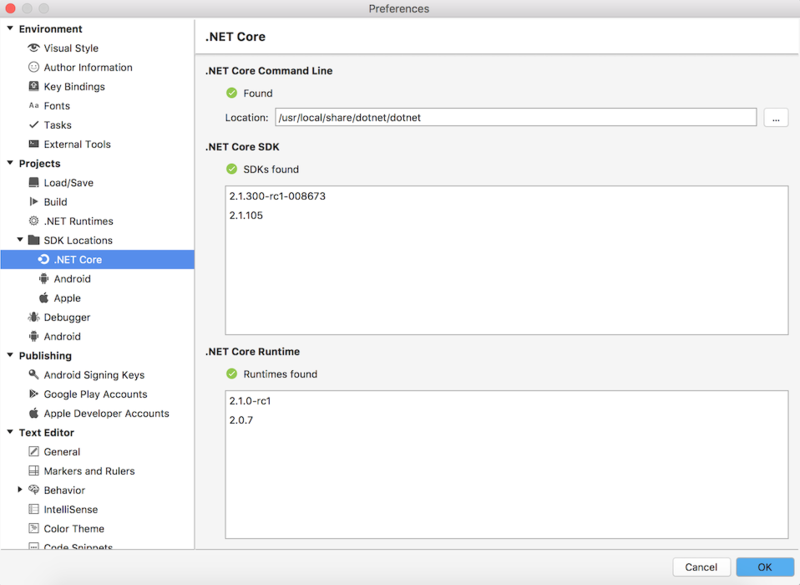 The following sections will look into the support provided by Visual Studio for Mac 7.5 for the .NET Core 2.1 SDK. If .NET Core 2.1.300 SDK is installed then the .NET Core 2.1 project templates will be available in the New Project dialog. The .NET Core 2.1 project templates are not included with Visual Studio for Mac and will be searched for in the 2.1.300 SDK templates directory. 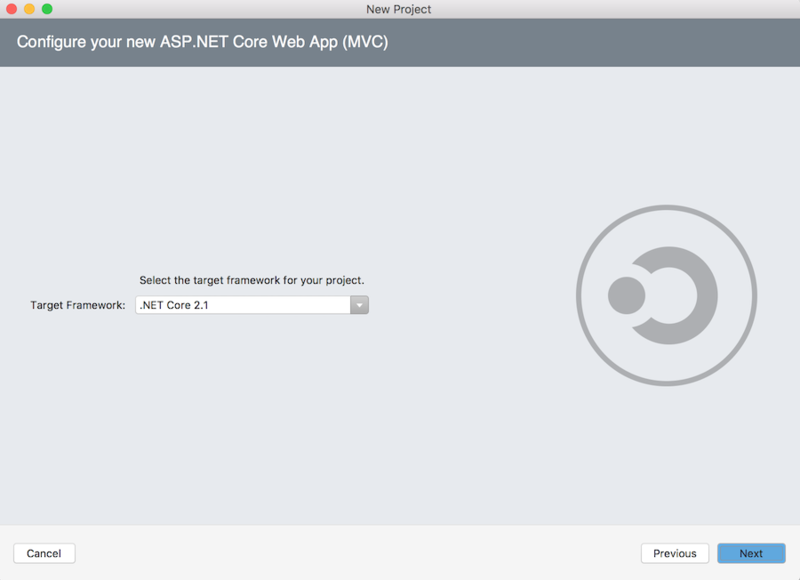 The project templates for .NET Core 2.0 and 1.1 are currently still being shipped with Visual Studio for Mac. ASP.NET Core 2.1 projects use HTTPS by default. In order to be able to run ASP.NET Core 2.1 projects with HTTPS a development certificate needs to be installed. Visual Studio for Mac will detect if the development certificate is missing and offer to install it when you run an ASP.NET Core 2.1 project that uses HTTPS. Visual Studio for Mac will use the dotnet dev-certs tool to check if the HTTPS development certificate is installed and trusted. Installing the HTTPS certificate requires administrator privileges so you may be prompted for your username and password after clicking the Yes button. 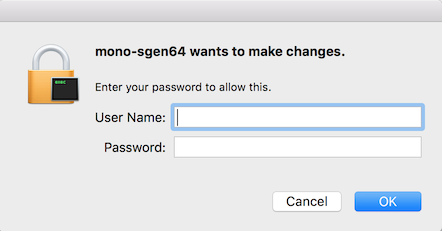 Currently the prompt for credentials shows mono-sgen64 wants to make changes. In the future this will show a custom message indicating that the credentials are required to install the HTTPS development certificate. After entering your credentials the following command is run as administrator. After the certificate is installed the ASP.NET Core 2.1 project will be opened in the default browser using HTTPS. Launches a separate custom console app. The console app uses the AuthorizationExecuteWithPrivileges Mac API provided by Xamarin.Mac to launch itself as again as administrator. It is not possible to run dotnet as administrator initially since it requires the user id to be set to 0, which is what happens when you use sudo dotnet, and this can only be done when running with administrator privileges. So the console app is launched again but this time with administrator privileges. The console app, now being run with administrator privileges, will use setuid to set the current user id to 0. The console app then runs dotnet dev-certs https —trust which will install and trust the HTTPS development certificate. The dotnet dev-certs https —trust command will add two localhost certificates. You can see these by opening the Keychain Access application and searching for localhost. If the HTTPS development certificate is found to be valid and trusted then this will be remembered for the current Visual Studio for Mac session and a check will not be run again during the current session. The .NET Core SDK 2.1 supports installing global tools. These tools are .NET Core console apps that are available as NuGet packages and can be installed and used from the command line. To be able to use these tools with the dotnet command line the ~/.dotnet/tools directory needs to be added to the PATH environment variable. The path to these global tools is now added to Visual Studio’s PATH environment variable when it starts. If a .NET Core 2.1 project is opened and .NET Core 2.1.300 SDK is not installed then a dialog will be shown allowing the SDK to be downloaded. The project in the Solution window will show an error icon indicating that the .NET Core 2.1 SDK is not installed. The .NET Core SDK 2.1 project templates for ASP.NET Core specify the https and http urls in the launchSettings.json file by using the applicationUrl property. With earlier .NET Core 2.1 preview SDKs this was defined in the ASPNETCORE_URLS environment variable. The full applicationUrl property was used unmodified when running the ASP.NET Core 2.1 project and resulted in an invalid url being used causing the AspNetCoreExecutionHandler to log a warning and not opening the browser. Now the first url in the applicationUrl is used if there are multiple urls. If the launchSettings.json does not define an applicationUrl then Visual Studio for Mac will fallback to checking the environment variable defined for ASPNETCORE_URLS in the launchSettings.json file and will use the first url found there. This url will be used to launch the browser when running the project. An example launchSettings.json that was used in the .NET Core 2.1 preview SDKs is shown below. Compared with the .NET Core SDK 2.0. In Preferences there is now a Projects – SDK Locations – .NET Core section that can be used to configure the location of the .NET Core command line tool (dotnet). This can be used to configure Visual Studio for Mac to use a .NET Core SDK that is not installed in the default location. After this is changed the MSBuild engine hosts are recycled and all .NET Core projects are re-evaluated to ensure the new locations of any MSBuild targets are used. If the location is invalid, or no runtimes or SDKs can be found at the configured location, a Not found error will be displayed. The Xamarin.Forms project templates, Blank Forms App and Forms App, will now create a .NET Standard 2.0 project instead of a Portable Class Library (PCL) project if .NET Standard is selected in the New Project dialog. 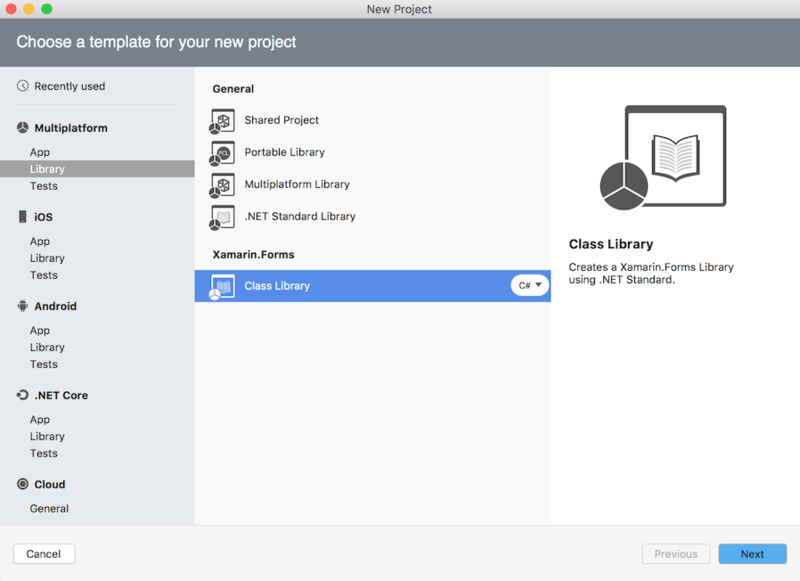 The Xamarin.Forms Class Library project template now creates a .NET Standard 2.0 project instead of a Portable Class Library project. 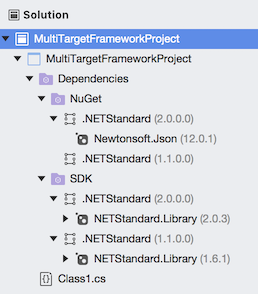 The Xamarin.Forms NuGet package has an MSBuild .targets file that is imported after the project items are defined. This .targets file overrides the DependentUpon property for all .xaml.cs files. This means that renaming the .xaml.cs file to be different to the .xaml file is not supported. To prevent this the Rename menu is now disabled in the Solution window for .xaml.cs files if they depend on a .xaml file. Recent versions of Xamarin.Forms NuGet packages exclude all .xaml files from the default None file wildcard defined by the .NET Core SDK. This exclusion is done in a .targets file which is applied after the items in the project file have been added. This means that a .NET Standard project should not use None items for .xaml files since they will be removed. To avoid this problem the None build action is excluded from the list of build actions for .xaml files. This list of build actions is available when right clicking the file in the Solution window and in the Properties window when the file is selected. When a file is renamed in the Solution window the dependent files will also be renamed if they start with the same name as the parent file. This avoids problems with XAML files since a different name for the .xaml file and the associated .xaml.cs file is not supported. Opening a .NET Core project that contained many files that were not excluded, such as a .NET Core console project that has a node_modules directory, could take a long time to load. Some performance improvements have been made to speed up the loading of .NET Core projects. For a .NET Core console project that had a node_modules directory containing around 17000 files the initial project load time which was taking around 70-80 seconds and now it takes around 20 seconds. Visual Studio 2017 on Windows takes around 15-20 seconds to load the same project before it is visible in the Solution Explorer window. Adding a faster project item lookup used when finding an existing project item on loading the project. Updating the existing project items is now faster avoiding iterating over the existing items. Evaluating MSBuild items is now only done when evaluating properties. Previously this was done when evaluating project configurations and run configurations. This would result in files and directories being searched multiple times when looking wildcard matches on loading the project. Now the files and directories are searched once during the initial project load. Templates that use files with @ character in their names being generated with the @ symbol encoded. Templates that use the Guid macro and did not specify a format would cause the template generation to fail. An exception was thrown since the format was not defined. Now if the format is not defined the default format is used. To help diagnose problems with project and item templates that use the .NET Core templating engine more detailed information about the failure is now logged in the IDE log. Item templates that use the .NET Core templating engine can be defined through a new extension point. Item templates are not currently supported in the New File dialog however there is an API that can be used by extensions to create files from these templates. This is currently used when adding a new Azure Function to a project. Saving a project with a file wildcard that had a Link with MSBuild item metadata, as shown below, would result in the wildcard being removed and replaced with MSBuild items for each file included by the wildcard. The problem was that the evaluated Link property value was being compared with the unevaluated value, which did not match, resulting in the wildcard being replaced with individual MSBuild items for each file. Now if the property value contains a % character a comparison is made against the evaluated value when checking if the project item has changed. A project containing the following MSBuild file wildcards would have extra MSBuild items added when the project file was saved. On saving the project Compile update items would be added for each file included by the file wildcard. This problem is similar to the previous problem where the evaluated Link value was being compared with the unevaluated value, which did not match, resulting MSBuild update items being added to the project when it was saved. Now if the property value contains a % character a comparison is made against the evaluated value when checking if the project item has changed. Adding a file to an SDK style project that targeted Tizen 4.0 would result in the TargetFramework changing from tizen40 to tizen4.0. Now the original framework identifier name is not modified and if the version of the framework changes then the version will be dotted or contain only numbers based on the format that was originally used in the project file. The .NET Core SDK does not indicate that .cshtml and .cs files are dependent on each other so they are not currently nested in the Solution window. New .cshtml files created from these updated file templates will now not be nested in Solution window. Adding a new content page with xaml to a .NET Standard project, then excluding the files from the project, but not deleting it, then editing the project file and commenting out the MSBuild remove items, would then result in the xaml files not being nested in the Solution window. The problem was that the MSBuild update item for the .xaml.cs file, defined by the Xamarin.Forms default msbuild items, was being removed from the MSBuild project in memory. This MSBuild update item had the DependsOn property defined so this information was lost on reloading the project. Now a check is to made to ensure only update items that exist in the original project file are removed. When copying a .xaml file from a Portable Class Library project to a .NET Standard project an MSBuild include item for the file would be added if the .xaml file did not have the default metadata properties defined by Xamarin.Forms. Now .NET Core projects opt-in to supporting items not being excluded if they are missing MSBuild item metadata which prevents an MSBuild include item added for the .xaml file. Copying a .xaml file from a Portable Class Library project to a .NET Standard project would result an MSBuild item for the .xaml file to the project causing it to not build due to a duplicate .xaml file. Now when a xaml file is copied into a .NET Standard project, and it is missing properties that are included in by an update wildcard, an MSBuild item will not be added to the project. With a .NET Core project, containing a single .xaml file and a dependent .xaml.cs file, removing but not deleting the .xaml file from the Solution window would not add an MSBuild remove item for the .xaml.cs file even though it was removed from the Solution window. The problem was that the Xamarin.Forms NuGet package includes a Compile update item and only this was being considered when saving the project file. The default file wildcard, that includes all .cs files, provided by the .NET Core SDK was not considered. Only the last MSBuild item associated with the .xaml.cs file was being considered. If there was another .cs file in the project then the MSBuild remove item was added correctly. To avoid this all MSBuild items associated with a project item are now considered. When an .xaml file was removed but not deleted, and Xamarin.Forms 2.5 used, which has default MSBuild items defined, on adding the .xaml file back again to the project the EmbeddedResource remove item was not removed from the project. The problem was that the .xaml file was being added as a None item since by default there is no build action specified for .xaml files. Another problem was that the MSBuild remove items, defined by Xamarin.Forms that remove all .xaml files from the default None included by the .NET Core SDK, were being ignored since the file wildcards were not found. Also an msbuild item is no longer added for an existing xaml file when it is added to the project. The Xamarin.Forms default msbuild items for .xaml files have extra metadata which were not being added to the file when it was added to the project from the file system. When the .xaml and .xaml.cs file were renamed at the same time an MSBuild update item was added for the .xaml.cs file even though the Xamarin Forms NuGet package has a default MSBuild item that was the same as the generated MSBuild update item. Opening a .NET Core project would sometimes log an unhandled ArgumentNullException. A file created event was sometimes raised before the project had finished loading and could result in a null set of items being used when checking if the new file should be added to the project. This is now handled. The files being created on project load are typically in the obj folder and would be ignored by the default file wildcards.